SUNSET UPON CRYSTAL CLIFFS: Within surrealistic scene, the viewer enjoys a multidimensional experience between the seamlessness of the room and the world beyond. The creature climbs towards a a destination unknown, but assumed to be within the world behind the window. 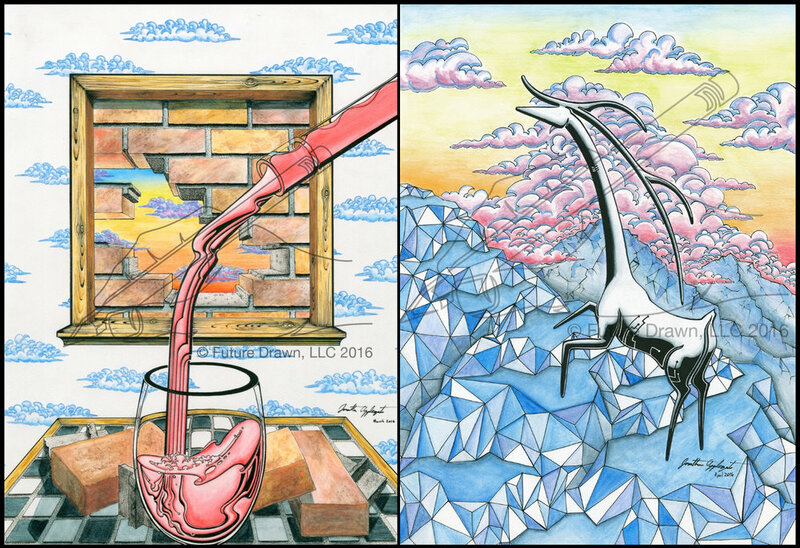 ORIGINATION OF CHESS: As the viewer enjoys a potentially gravity defying glass of wine, they can see chess pieces being created within a surreal scene of game board hills and whimsical clouds. Below and behind the scene, the gentle creature climbs towards the source of his existence. SILICON VALLEY AND THE BRIDGE: From a classic perspective the viewer is taken from San Francisco to Silicon Valley and the micro-electronic world unseen. Climbing and unfolding the power of innovation, the creature gracefully opens new possibilities.